This is the "Deluxe". 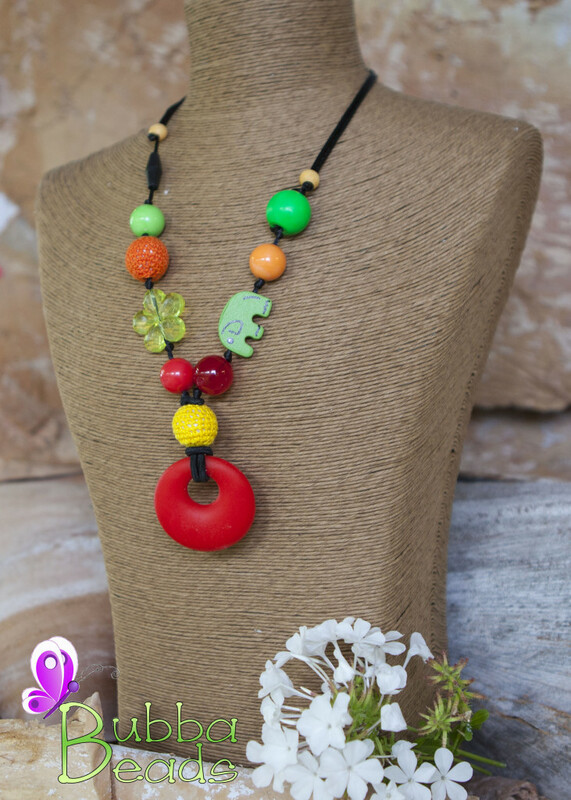 With bright and colourful insects, extra chewable silicon beads, and cool twirlers and fiddler beads, this necklace will keep the busiest hands occupied! Pictured with a Blue Round Silicon Pendant. If you would like to add a name, or a phrase, or change to a coloured satin cord, you can do this below. Please also be sure to select if you would like your necklace to be symmetrical, or have a variety of interesting beads. If you would like specific colours the choices are: Soft Pink, Hot Pink, Green, Yellow, Orange, Red, Bright Blue, Light Blue, Purple, Black, White, Natural, Silver and Bronze. 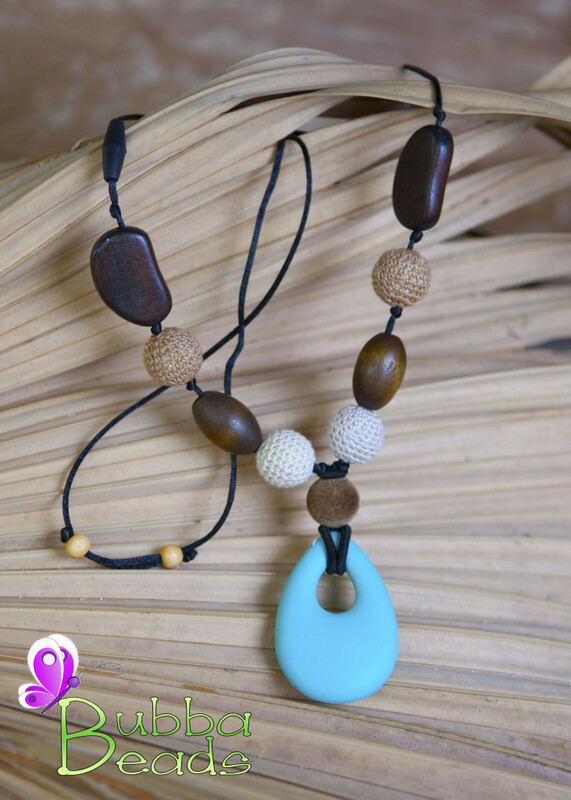 With a blend of natural and stained wood beads, neutral tones and a rustic feel, this will suit everyone, while still maintainin a babies interest with textures and shapes. Pictured with a Teal Teardrop Silicon Pendant, and in a Symmetrical style. The colours bring to mind Summer fruits and lollies - nom nom nom! Apparently red is the first colour babies can see, so Tutti has been created to be highly visually stimulating, and unisex. Pictured with a Red Round Silicon Pendant. The "Rainbow". This one covers the spectrum, with bright textured beads. A great learning tool, as well! Pictured with a Purple Round Silicon Pendant. If you would like to add a name, or a phrase, or change to a coloured satin cord, you can do this below. 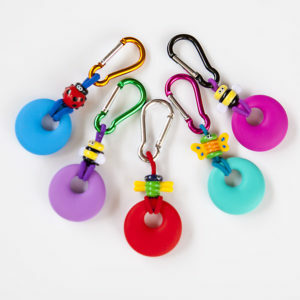 These high contrast beads are perfect for younger babies with developing eyesight. They are also great for older kids, who don't need as many different textures. Pictured with a Black Teardrop Silicon Pendant. Have it your way! Whether you want to support your favourite team, keep it simple with 1colour, or make it interesting with 2 or 3 colours, this is the one for you. Pictured in Pink and Hot Pink, with a Soft Pink Teardrop Silicon Pendant. If you would like to add a name, or a phrase, or change to a coloured satin cord, you can do this below. 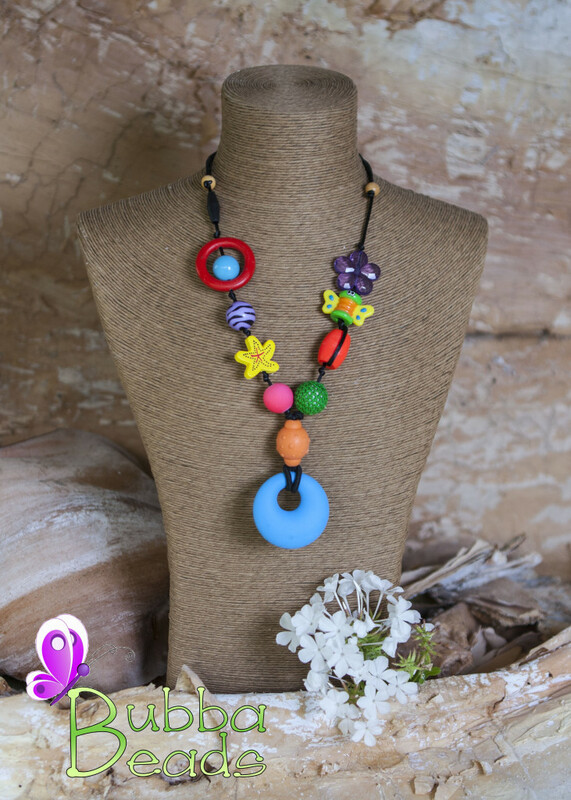 Please also be sure to select if you would like your necklace to be symmetrical, or have a variety of interesting beads and colours. 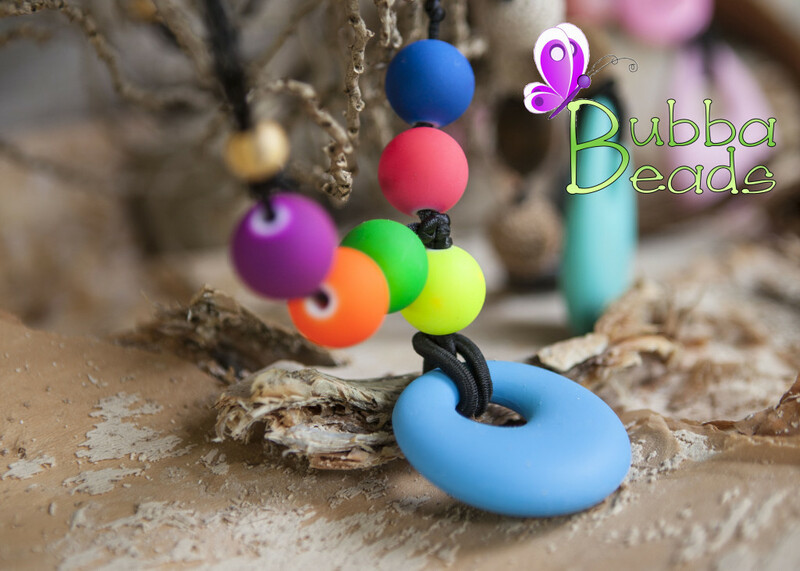 Get them a gift voucher for a BubbaBeads necklace, and they will receive beautifully presented voucher, containing a unique code. This code can be entered on checkout in our online store. 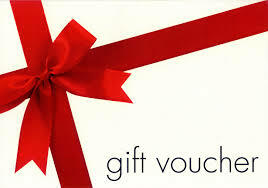 The recipient can shop online in our store, choose a style, add a name, pick a coloured cord etc, and then when they check out and enter their code, there will be nothing for them to pay. This is the 'Go-to' accessory that can be with you anytime you are out and about without having to make a mental note to pack it! Have it attached to your bag, your purse, or your key-ring. Great for those times when you are standing in line, waiting in waiting rooms or just trying to shop with minimum of fuss.